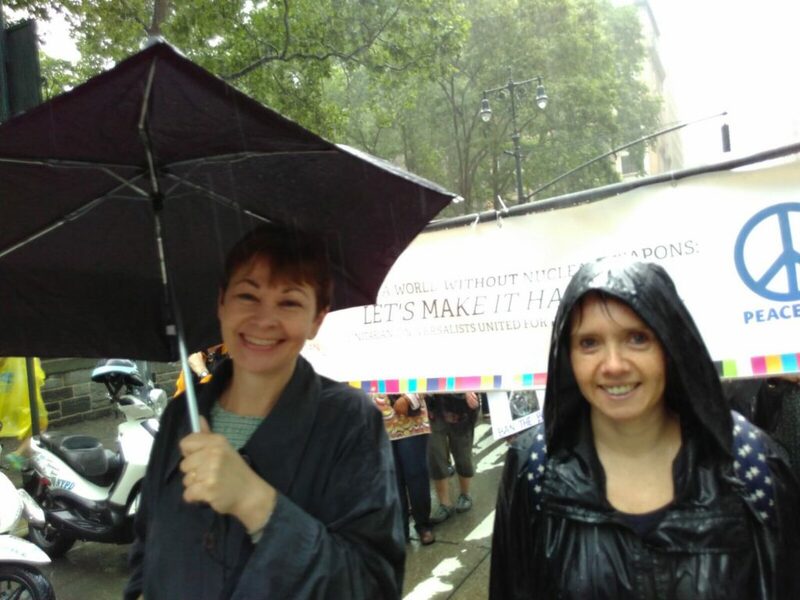 Caroline Lucas is a local MP, co-leader of the Green Party, regularly in the media, and chair of numerous groups, including Parliamentary CND. She is subject to a huge amount of lobbying and considerably more than your average MP, with upwards of 1000 emails and letters a day! A clear subject header – this will hugely help whoever is looking after the inbox to triage your message and get a reply to you as quickly as possible. A clear ask – you might want your MP to sign an Early Day Motion (EDM), speak in a debate, vote for something, ask a parliamentary question, write to a Minister, turn up to an event, meet you or just let you know their position etc. Spell out what you want and include links (e.g. to an EDM) or information if you have it (e.g. date and location of an event). Short and to the point – a few succinct paragraphs is plenty. Put your ask near the top and in the final paragraph. Identify yourself – let the MP know you are a constituent from the outset and provide your postal address. Most MPs will not reply to non-constituents and if they have to check your address it’s one extra task for you both. Do your research – don’t ask an MP to sign an EDM if they’ve already done so or have been the one to sponsor the motion. Instead, perhaps thank them for their support. Similarly, if they’ve already put a statement on their website saying they are going to vote for something, acknowledge that in your correspondence. Address one issue at a time – sometimes we get emails that start off being about nuclear weapons, then move onto Brexit, mention housing in passing and finish off with a question about fox hunting. You’ll get a much better quality of reply if you focus. Many of the emails we receive are part of mass lobbying campaigns using standard text. If you want to personalise your message, that’s great and definitely demonstrates how important the communication is to you, but don’t feel you have to. Most MPs won’t have time to send personalised responses to mass lobbying campaigns – not because they don’t care, but just because of the volume involved. Personal details can especially help bring a topic to life for MPs that are not already sympathetic. So know your MP and if you know they have grandchildren too, mention that. We love being lobbied because it’s a major way of staying in touch with what constituents are thinking and feeling, as well as of helping ensure parliamentary work remains relevant. Lobbying helps MPs prioritise their workload too. And if they get several emails or letters on the same topic, they are much more likely to raise it in Parliament. Expect to get a reply within a few weeks but do be patient – most MPs work incredibly hard and may prefer to send more detailed, helpful replies than quick one liners, even if it takes a bit longer. Being lobbied is an opportunity and good MPs will want to make the very most of it. If you’ve asked them to write to a Minister, it can easily take 3 months for the Minister to write back. Show your MP some love and appreciation when you think they deserve it and you’ll build a better relationship with them. So if they vote the right way and you notice, drop them a line to say thank you, especially if you want them to be more receptive to what you have to say in future. Meeting your MP at a surgery is a really great way to lobby them – if Caroline has seen someone face to face, there’s a sense of connection and responsibility that’s always going to be stronger than that from reading an email or letter. It’s wise to use the opportunity to attend a surgery sparingly as appointments may be few and far between, and case work will often be given priority. Go prepared to make your case in less than 2 minutes to allow plenty of time for questions and dialogue. As with writing to your MP, have a clear ask and do your research. A group of you going together to a surgery can also be really effective. Most MPs will advertise their surgeries or you can call their local offices to find out details. Lots of MPs won’t sign EDMs, so if this is your ask give them an alternative option too. For example, to share the EDM with the Minister for comment and to pass on the response to you. Use social media – but sparingly. There are so many ways to contact your MP nowadays and the majority are active on social media. But it’s hard to tell who’s a constituent and the volume of communication is vast, so don’t rely on that if you’d like a reply. Be honest with your MP. Tell them if you are unhappy with them, angry or disappointed, as well as if you are proud. Just keep it polite – an abusive or overly rude message is much more likely to end up deleted or in the recycling bin. Let's Go Speak Truth to Power! So let’s get out there, you can find full details of your MP & their voting record by entering your postcode in the They Work for You website. If you’re nervous or have any questions, please give us a call, we may be able to find other YCND members in your constituency who’d like to accompany you on a surgery visit or just chat through their experiences. Make sure you follow Cath’s checklist above and do let us know if you have any successful tips of your own you’d like to share. Getting to know and build trust with your MP is an ongoing process, don’t lose heart if you don’t get a reply first time, keep trying. If you do receive a reply from your MP or have a meeting with them please fill out a feedback report. How responsive was your MP, did any particular argument seem more effective? Were any concrete actions agreed? E.g To sign the Parliamentary Pledge or raise a question in the house. Do you plan any follow up? Particularly is there anything we can help with?